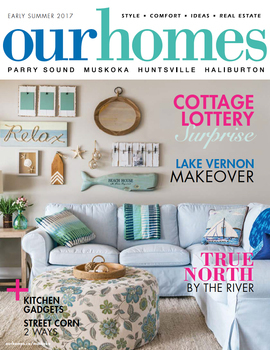 A version of this article originally appeared in the Early Summer 2017 issue of OUR HOMES Parry Sound Muskoka Huntsville Haliburton, p.38. Find local businesses in our Muskoka directory. Originally built in the 1990s, an outdated cottage on Lake Vernon was transformed into a stylish lakefront home with the help of Muskoka Custom Cottages. Looking for a place to gather a large, grown family, these homeowners opted to work with the existing structure rather than rebuild. They started by resealing the original whitewashed pine walls and ceilings, giving them a fresh coat of Simply White by Benjamin Moore, and refinished the original fir and elm floors.